I think that because I have lived most of my life in a tropical, hot country, Brazil, it has always been a bit of a struggle for me to adjust to low temperatures. 51 degrees F has been the average temperature here in South Central Texas lately. Perhaps to you that may not seem very cold, but to me it does… To warm ourselves up, I have prepared for dinner this amazing and comforting Potato Bisque with Chouriço in Red Wine!!! Well, in addition to putting on some winter clothes, I love to drink warm beverages and eat a good soup. Oh, by the way, I happen to be preparing a delicious one today as I mentioned earlier. This potato bisque blends ingredients from both Portuguese (e.g. potatoes, choriço, and red wine) and Brazilian cuisines (coconut milk). It is hearty, creamy, and warm with a hint of the tropics (coconut milk). It also has a good contrast of flavors (the mildness of the potato cream with the smokiness and spiciness of the sausage). Sorry! 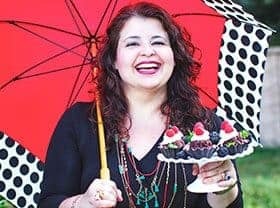 But when it comes to soups, there is no cuisine like those two that can make fond memories flow and put a smile on my face. 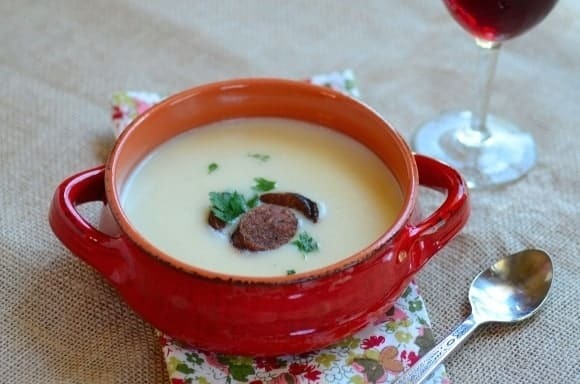 Anyway, before I take this conversation far afield with stories about me and my family around the table loooong ago, I will leave off here, wishing that you enjoy the flavors of my potato bisque, and make lots of good memories with your own family around the table where this bisque will be served!! 1. In a medium saucepan, over medium heat, heat 1/4 cup olive oil and cook the leeks, onion, and garlic until tender, about 5-7 minutes. Then, add the potato and let cook for an additional 3 minutes, stirring constantly (Do not allow the vegetables to brown and consequently alter the pale color of the bisque. The goal here is to cook them just enough to bring out their flavor and render them tender enough to liquefy in the blender). 2. Add the chicken stock to the pan, increase the heat to medium-high, and let come to a boil. As soon as it starts boiling, cover and reduce heat to medium-low. Let cook for about 10 minutes, add the coconut milk, cover again, and cook for additional 5 minutes or until the potatoes are fully cooked. 3. Remove from heat and let cool down a bit. Blend well in a blender until creamy (if necessary, blend in 2 or 3 batches to avoid overflows/spills). Stir in the salt and pepper. Reserve. 4. In a heavy-bottom skillet, over medium-high heat, heat well 1 tablespoon olive oil. Add the sausage slices and sauté for about 1 minute each side. Reduce heat to medium, add the wine, and let cook for about 2 minutes or until the wine has been evaporated. 5. Serve the potato bisque with a few slices of the sausage on the top, sprinkled with chopped parsley. Potato bisque can be accompanied by toast and a good red wine. 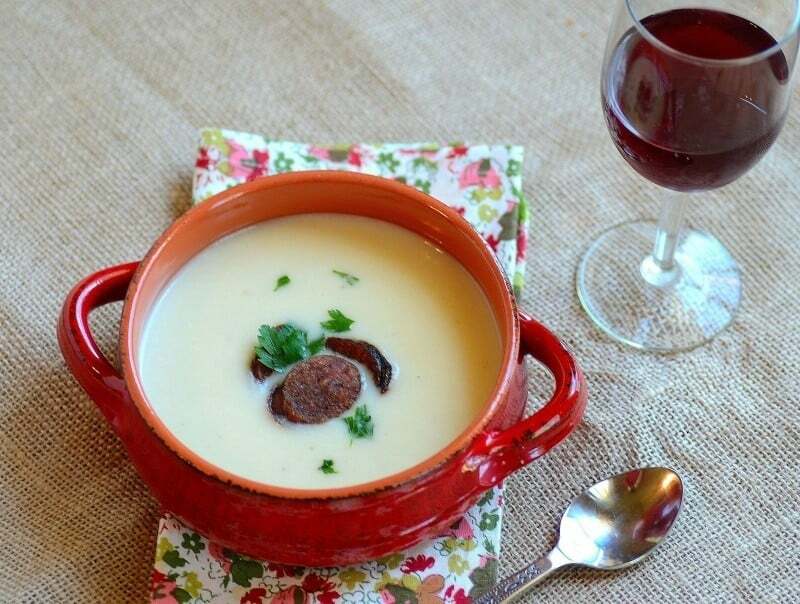 Enjoy Potato Bisque with Chorico in Red Wine!